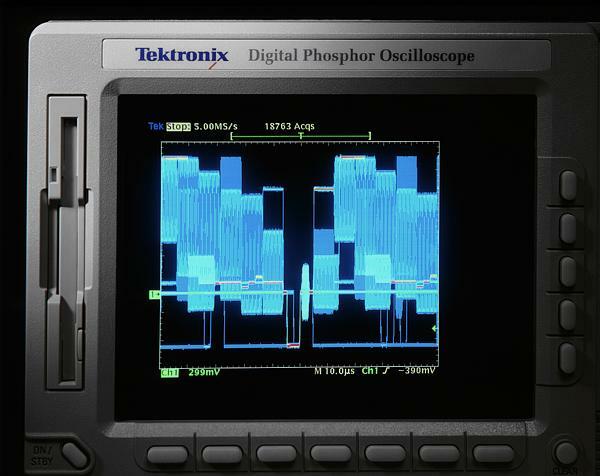 Digital Phosphor Oscilloscopes deliver a level of insight that makes dealing with complex signals elementary. DPOs capture, store, display and analyze, in real time, three dimensions of signal information: amplitude, time and distribution of amplitude over time. The benefit of this third dimension of information is an interpretation of the signal dynamics, including instantaneous changes and the frequency of occurrence displayed in the form of quantitative intensity information. The resulting information-rich display enables the user's eye to integrate the subtle patterns and variations of actual signal behavior. Extensive user interface design has made the TDS784D truly intuitive to operate. Its familiar front panel layout offers dedicated vertical, horizontal and trigger controls. A graphical user interface with over 200 icons helps facilitate understanding and use of the advanced features. A color monitor helps rapidly distinguish between multiple waveforms and measurements. Online help provides a convenient built-in reference manual. The high waveform capture rate of the TDS784D DPO, together with its high bandwidth and sample rate, delivers instantaneous signal feedback to show the true signals that other scopes may be missing. The DPO acquisition acquires over 1,000 times more data than traditional DSOs, allowing the capture of complex signals, reducing debugging times from hours to seconds. 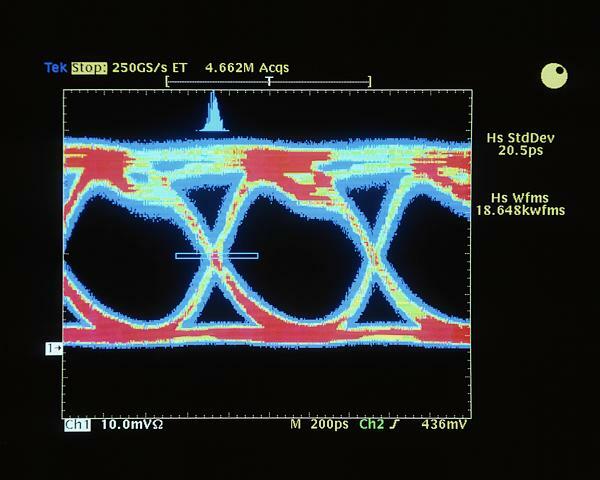 Channels can be transparently combined to achieve higher sample rates and longer record lengths. The record length can be optionally increased to 8 M points, providing a high-resolution representation of the signal over a long period of time. The TDS784D also provides wide dynamic range, flat response, fast overdrive recovery, calibrated DC offset, 1 mV/div sensitivity, 1 ns peak detect and internal calibration. In addition to basic triggering such as edge and pulse-width, this digital phosphor oscilloscope has several trigger modes tailored for specific design and debug applications. Logic and pulse triggers, including setup/hold, glitch, slew rate and timeout triggers, capture hard-to-catch digital design problems. The optional video trigger provides line and field selection for NTSC, PAL and HDTV standards. The optional communications trigger capability addresses needs to acquire a wide variety of AMI, CMI, NRZ and Ethernet communication signals. A traditional DSO is unable to display the details and dynamic changes of this composite video waveform. 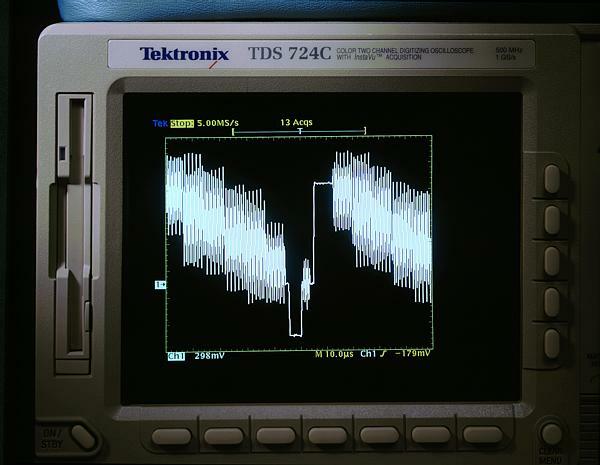 The same composite video signal, captured with a digital phosphor oscilloscope, shows all the details of this complex waveform in real time. Color-grading displays historical information that has been acquired over time. This is especially powerful when used in DPO operation, where the colors show relatively how often random events occur. Automatic measurements eliminate the need for manually measuring the waveform against the graticule or with cursors. Measurement gating (gating not available for DPO operation) allows the user to select a specific part of the live waveform for measurement. Measurement statistics (min, max, mean and standard deviation) give additional information about the variations in the measurements over time (for example, worst case excursions), increasing the confidence in the quality of the measurements. Waveform histograms allow the examination of the statistical nature of the signal. Horizontal histograms, which are useful for evaluating signal jitter, sample the waveform within a specified region, sort the values into time bins and plot the accumulated bin values versus time. Vertical histograms, which are useful for evaluating signal noise, sample the waveform within a specified region, sort the values into amplitude bins and plot the accumulated bin values versus amplitude. For histograms of DPO acquisitions (both live and stored), the specified region can be repositioned and will update to reflect the underlying 3 dimensional data base (32 bits in shallow mode, 64 bits in deep mode). Communication mask testing (available as an option) allows mask compliance testing of a wide variety of communication signals to industry standards. Specialized measurement accessories, unique trigger modes, built-in optical reference receiver filters, mask autoset and mask violation counting make these measurements easily and repeatedly. The horizontal histogram of the selected region of the waveform shows the character of a metastable flip-flop output. These Java based application packages reduce the cost, time and complexity common to many application-specific test procedures. These application-specific capabilities are easily installed via floppy disks and require a hard disk drive (Option HD or Option 2M). TDSPWR1 gives designers interested in power consumption applications the ability to automatically calculate True Power, Apparent Power, Power Factor, Instantaneous Power and Energy to eliminate manual calculations. TDSJIT1V2 performs a suite of jitter measurements with unprecedented accuracy on single-shot waveforms. 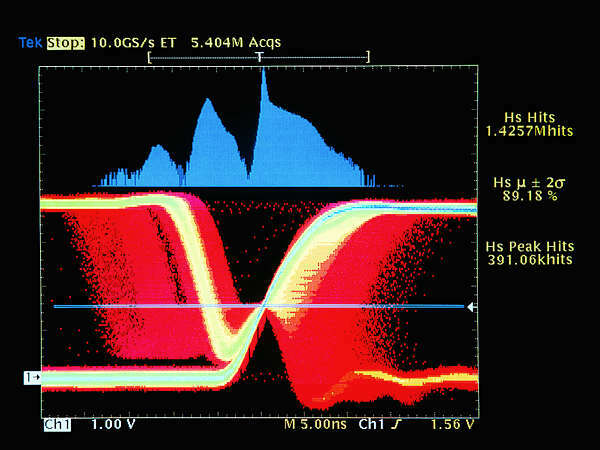 Jitter information can be displayed as statistics, histograms, time trends or jitter spectrums. This software makes timing measurements by providing statistics on specific, fully time-correlated data and clock edges. It also performs automated AC timing measurements on all parameters in single-shot acquisitions. TDSCEM1 performs a suite of automated eye diagram measurements on SONET/SDH and Fibre Channel standards. These measurements include eye height, eye width and quality factor. TDSCPM1 performs automated parametric measurements of pulse amplitude, spectral power and pulse symmetry to standards requirements. Standards include ANSI T1.102 and ITU-T G.703. Java is a registered trademark of Sun Microsystems. Tektronix provides a wide range of measurement accessories optimized for the TDS784D. These accessories are designed to operate via the TEKPROBE interface, which provides power and automatic scaling, to complete the DPO measurement solutions. A SONET/SDH (OC-3/STM-1) signal is compared with the standard mask, showing a compliant waveform. Active Probes, such as the P6245, were designed specifically for the DPO products. For example, the P6245 (1.5 GHz probe only) is capable of achieving the full 1GHz bandwidth on a TDS784D, while providing low loading. Optical-to-electrical Converters (P6701B, P6703B) allow convenient analysis of optical transmission signals with the oscilloscope. Both short- and long-wavelength optical converters are compatible with the industry-standard wavelengths for SONET/SDH and Fibre Channel. High-bandwidth Differential Probes (P6248, P6247, P6330) enable high bandwidth differential measurements while maintaining high common-mode rejection. Current Probes such as the TCP202 and High-Voltage Differential Probes such as the P5205 and P5210 allow safe, high-power measurements. Direct probe readouts use information from the probes to display measurements in units of amps, volts and watts. Save screen displays in a number of standard desktop publishing formats to the internal 3.5 in. Microsoft DOS-compatible floppy disk drive. Transfer the disk to a PC for import into word processing applications. Make hardcopies directly to monochrome or color printers and plotters connected to the computer network (LAN), GPIB, RS-232 or Centronics ports, or acquire waveforms, screen displays and scope settings using Tektronix WaveStar™ software running on a PC interfaced to the GPIB port. *1 In 50 Ω mode: 5 mV/div: 750 MHz, 2 mV/div: 600 MHz, 1 mV/div: 500 MHz. Reduce the upper bandwidth frequencies by 5 MHz for each degree C above 30 °C. *2 Single-channel operating at full sample rate and maximum record length (Opt. 2M). ≤10 Hz when AC 1 MΩ coupled. ≤200 kHz when AC 50 Ω coupled. 300 V CAT II ±400 V (peak). Derate at 20 dB/decade above 1 MHz. 1 MΩ or GND coupled. DPO - Captures and displays complex waveforms, random events and subtle patterns in actual signal behavior. By acquiring up to 100 M points/sec, the TDS784D DPO is able to provide 3 dimensions of signal information, in real-time; amplitude, time, and the distribution of amplitude over time. The DPX™ Waveform Imaging Processor automatically selects record lengths between 500 and 500,000 points and sample rate up to 1 GS/s, based on horizontal time base setting, to optimize displayed sample density. Peak Detect - High frequency and random glitch capture. Captures glitches of 1 ns using acquisition hardware at all real-time sampling rates. Average - Waveform data from 2 to 10,000 (selectable) is averaged. Hi-res - Vertical resolution improvement and noise reduction on low-frequency signal (e.g. 12 Bits typical). FastFrame™ Time Stamp - Acquisition memory size segmentable with trigger rate up to 80,000 per second from 50 to 5,000 points per frame (independent of the number of channels). Single Sequence - Use RUN/STOP button to capture a single triggered acquisition at a time, which may be automatically saved to NVRAM with AutoSave. Triggers - Main and delayed. Main Trigger Modes - Auto, normal, single. Delayed Trigger - Delayed by time, events or events and time. Time Delay Range - 16 ns to 250 s.
Events Delay Range - 1 to 9,999,999 events. External Rear Input - ≥1.5 kΩ; Max input voltage is ±20 V (DC + peak AC). EDGE (main and delayed) - Conventional level-driven trigger. Positive or negative slope on any channel or rear panel auxiliary input. Coupling selections: DC, AC, noise reject, HF reject, LF reject. LOGIC (main) - PATTERN: Specifies a logical combination (AND, OR, NAND, NOR) of the four input channels (high, low, don't care). Trigger when pattern stays true or false for a specified time. STATE: Any logical pattern of channels 1, 2, and 3 (AUX1 on 2-CH products) plus a clock edge on channel 4 (AUX2 on 2-CH products). Triggerable on rising or falling clock edge. SETUP/HOLD: Trigger on violations of both setup time and hold time between clock and data which are on two input channels. PULSE (main) - GLITCH: Trigger on or reject glitches of positive, negative, or either polarity. Minimum glitch width is 1.0 ns (typical) 2 ns (warranted) with 200 ps resolution. WIDTH: Trigger on width of positive or negative pulse either within or out of selectable time limits (1 ns to 1 s). SLEW RATE: Trigger on pulse edge rates that are either faster or slower than a set rate. Edges can be rising, falling or either. TIMEOUT: Trigger on an event which remains high, low, or either, for a specified time period, selectable from 1 ns to 1 s, with 200 ps resolution. COMM (optional) - AMI: Trigger on standard communications signals (including DS1, DS1A, DS1C, DS2, DS3, E1, E2, E3, STS-1 or a custom bit rate). Select between "isolated ones" (positive or negative) and eye diagrams. CMI: Trigger on standard communications signals (including STS-3, STM1E, DS4NA, E4 or a custom bit rate). Select between positive or negative one pulses, zero pulses and eye diagrams. NRZ: Trigger on standard communications signals (including OC1/STM0, OC3/STM1, OC12/STM4, E5, FC133, FC266, FC531, FC1063, FDDI HALT, 143 Mb/s serial digital composite video, 270 Mb/s serial digital component video or a custom bit rate). Select between an eye diagram, rising or falling edges or any of eight 3-Bit serial patterns. VIDEO (optional) - Trigger on a particular line of individual, odd/even or all fields. Trigger on a specific pixel of a line by using the video trigger with delay by events. Choose positive or negative horizontal sync polarity. 525/NTSC: Choose monochrome or color (studio-quality NTSC) sync formats. 625/PAL: Choose color or monochrome (studio-quality PAL) sync formats. HDTV: Choose from 1125/60, 1050/60, 1250/50 and 787.5/60 HDTV formats. Automatic Waveform Measurements - Period, frequency, +width, -width, rise time, fall time, +duty cycle, -duty cycle, delay, phase, burst width, high, low, max. min, peak to peak, amplitude, +overshoot, -overshoot, mean, cycle mean, RMS, cycle RMS, area, cycle area, extinction ratio (ratio, dB, %) and mean optical power. Continuous update of up to four measurements on any combination of waveforms. Measurement Statistics - Display minimum and maximum or mean and standard deviation on any displayed single-waveform measurements. Gating - Any region of the waveform may be isolated for measurement using vertical bars. Snapshot - Performs all measurements on any one waveform showing results from one instant in time. Cursor Measurements - Absolute, Delta: Volts, time, frequency and NTSC IRE and line number (with video trigger option). Cursor Types - Horizontal bars (volts), vertical bars (time); operated independently or in tracking mode. Waveform Functions - Sin(x)/x or linear interpolation, average, envelope. Advanced Waveform Functions - FFT, integration, differentiation. Arithmetic Operators - Add, subtract, multiply, divide, invert. Autoset - Single-button, automatic setup on selected input signal for vertical, horizontal and trigger systems. Also automatically normalizes signals to standard masks when used with the mask testing option. Waveform Limit Testing - Compares incoming or math waveform to a reference waveform's upper and lower limits. Waveform Histograms - Both vertical and horizontal histograms, with periodically updated measurements, allow statistical distributions to be analyzed over any region of the signal. For histograms on DPO acquisitions, both live and stored, the specified region can be repositioned and will update to reflect the underlying 3 dimensional data base, in both YT and XY modes (32 Bits in shallow mode, 64 Bits in deep mode). Mask Testing (optional) - In addition to the standard communication masks in the instrument, the masks can be edited on the screen. 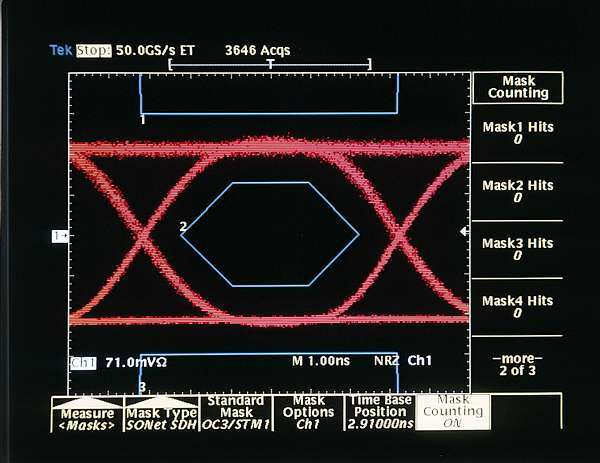 Together with automatic waveform scaling, the mask tests give rapid verification of a digital bit stream's conformance to pulse templates and eye pattern masks. For optical conformance testing, the internal Fibre Channel and SONET/SDH optical reference receiver filters provide convenient test setup which is compliant to industry standards. Zoom Characteristics - The zoom feature allows waveforms to be expanded or compressed in both vertical and horizontal axes. Allows precise comparison and study of fine waveform detail without affecting ongoing acquisitions. When used with Hi-res or Average acquisition modes, Zoom provides an effective vertical dynamic range or 1,000 divisions or 100 screens. Zoom features not available on DPO operations. Dual Window Zoom - Dual graticules simultaneously show selected and zoomed waveforms. Up to two zoom boxes show areas on the selected trace that are being magnified, and the two magnified areas can be overlapped for quick comparison. Color of zoomed trace matches selected trace. Waveform Style - Dots, vectors, variable persistence from 32 ms to 10 s, infinite persistence and intensified samples. Color - Standard palettes and user-definable color for waveforms, text, graticules and cursors. Measurement text and cursor colors matched to waveform. Waveform collision areas highlighted with different color. Statistical waveform distribution shown with color grading through variable persistence. Color Grading - With variable persistence selected, historical timing information is represented by temperature or spectral color scheme providing "Z-axis" information about rapidly-changing waveforms. Graticules - Full, grid, cross-hair, frame, NTSC and PAL (with video trigger option). Format - YT and XY (and XYZ and dual XY in DPO operation). Type - 7 in. diagonal, NuColor™ liquid crystal full color shutter display, 256 color levels. Resolution - 640 horizontal by 480 vertical displayed pixels (VGA). GPIB (IEEE-488.2) Programmability - Full talk/listen modes. Control of all modes, settings, and measurements. Printer - Phaser 740N/740P, HP Thinkjet, Deskjet, Laserjet, Epson, Interleaf, PostScript, TIFF, PCX, BMP, DPU411/412, RLE. Data - MathCad, spreadsheet formats. Hardcopy Interface - Centronics and RS-232 (talk only). Non-volatile Waveform Storage - 4 full 50 K records (Opt. 1M or 2M: 4 full 130 K records, 2 full 250 K records or 1 compressed 500 K record). Non-volatile Storage for Setups - 10 front panel setups. Floppy Disk Drive - Store reference waveforms, setups and image files on 3.5 in. 1.44 MB or 720 K MS DOS-format floppy disk. Iomega Zip and Zip Plus Drive Compatible - Compatible for waveform and front panel setup file transfer to Iomega Zip and Zip Plus Drives. Line Voltage Range - 100 to 240 VRMS, ±10%. Line Frequency - 45 to 440 Hz. Power Consumption - 350 W max. Temperature - Operating: +4 °C to +50 °C (floppy not used), +10 °C to +50 °C (floppy in use). Nonoperating: -22 °C to +60 °C. Humidity - Operating: To 80% RH at ≤ 32 °C. Derates to 30% RH at +45 °C. Nonoperating: To 90% RH at ≤ 40 °C. Derates to 30% RH at +60 °C. Altitude - Operating: 15,000 ft. (hard disk not used), 10,000 ft. (hard disk in use).